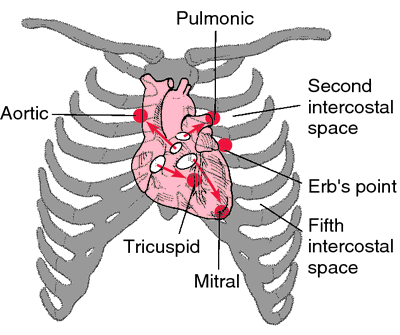 the fourth heart sound in the cardiac cycle. It occurs late in diastole on contraction of the atria. Rarely heard in normal subjects, it indicates an abnormally increased resistance to ventricular filling, as in hypertensive cardiovascular disease, coronary artery disease, cardiomyopathy, and aortic stenosis. A left-sided fourth heart sound, it may be heard with the stethoscope's bell at the apex of the heart during expiration. Also called atrial gallop, physiologic fourth heart sound. Q. i've been having a neckache 4 2 wks what could be causing it? A. Have you tried changing the way that you sleep? Q. i am a size 12 and i need to get down to a size 4 fast how do i do it?? A. you are 15- try not to develop an eating disorder..i'm not sure that size 12 is considered overweight for age 15.. (depends on height and some other things) but size 4 is extremely thin for a 15 years old. i mean- an anorexic skeleton. that's not even the least attractive, if that is what you want to accomplish. loosing weight "fast" is always- ALWAYS!! a bad idea. it should be done moderately so your body will have the time to adjust, unless you look for severe health problems. Q. what could cause leg pains in a 4 yr old? A. It depends on many factors. Was there any trauma to the leg? In that case the pain may result from fracture or damage to the joint. Is there any swollen/red/painful joint? In that case the pain may result from inflammation of the joint. Prompt referral to medical treatment is essential since in that case, early treatment may make the save the joint. Does he have any rash on his legs? Elsewhere on his or her body? Rash with pain in the joint may be due to rheumatologic diseases such as rheumatic fever, henoch-shonlein purpura and many others. The causes are numerous, and I wrote only a fraction of them. Not to mention the fact that it's practically impossible to diagnose people over the net. Pediatrician is the address in this case.